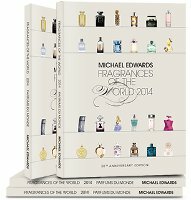 Michael Edwards has released the latest version of his “fragrance bible”, Fragrances of the World 2014. The reference book celebrates its 30th anniversary this year. The 2014 edition lists over 8,000 fragrances grouped by fragrance family, and includes over 1,200 new releases. The book is used by numerous retailers to help customers find fragrances they might like based on the scent(s) they already know and enjoy. One of my first clients was a group of pharmacies, who asked me to help develop their fragrance category. I could train their staff, but I needed a guide, a sales tool to help them select the right fragrances for each customer. The only one then available was very technical which was why I was forced to create my first guide. The 1984 edition listed just 38 new fragrances. In my wildest dreams, I could never have imagined that thirty years later, I would track more than 1,400 new fragrances in a single year or that the tiny guide would grow to become the industry's 'fragrance bible’. The edition is bilingual (English/French), and can be ordered through Fragrances of the World for $210. There is a 10% discount if you use coupon code FOTW2014 order before the end of February. I’d like to have one, but can’t make myself spend the money. Surprised you found one for a song on Amazon! They don’t have any there now dirt cheap. I love to read this reference guide and, fortunately, one of my local libraries has a recent version on their shelves. I do have to say that I find some of his suggestions for scents on the website totally weird. The suggestions are essentially by fragrance family and notes…it’s probably the best general method, not sure it always applies for a perfumista, who might be just as interested in other issues (style, quality, etc). I see what you are saying, but I still think it fails frequently. For example, JP Joy – I do not think the recommendations are accurate by note or “feel”. Because Joy is essentially floral, one suggestion is Feerie Spring Blossom. Guess I just don’t understand this. Look at it this way. You’re an SA, and someone comes in and says I need a new fragrance, I wear Feerie Spring Blossom but want something new. And you, the SA, have never smelled Feerie Spring Blossom, in fact, let’s say you don’t even carry Feerie Spring Blossom. You look it up in the book, you get a whole list of fragrances in the same sub-family. Now you have someplace to start. It doesn’t mean your customer will like everything on that list, but it radically narrows down the *likely* possibilities, and of course you add your own knowledge and can ask more questions…you may deduce that this person probably isn’t going to love Joy, but they might love other newer things in this category. The website recommendations are different from the book since a) you only get 3 and b) they take other factors into account. And agree, they frequently fail — I just looked up Diptyque Philosykos and got Womanity Aqua Chic and CK One Summer. Don’t think so. But that’s not how an SA would use the book. Wow! For people who are in “love” with fragrance, this would be a nice Valentine’s Day gift. I would love to get this for that special day. Like most though, I’m not quite sure I would be able to let go of $210.00 for a book. But, again, it would make for a nice gift. It’s mostly a list of fragrances classified by fragrance family, mind you. The average person in love with fragrance probably doesn’t need it…but if you like to know a fragrance’s classification, then hey, you need one. I certainly wouldn’t mind taking a look, for example if the local library had a copy, but I’m going to spend my $200+ dollars on actual scents! The big problem here is that no one book can compete against what is available online, except perhaps in a very niche area, such as the Burr book about certain aspects of the fragrance industry.